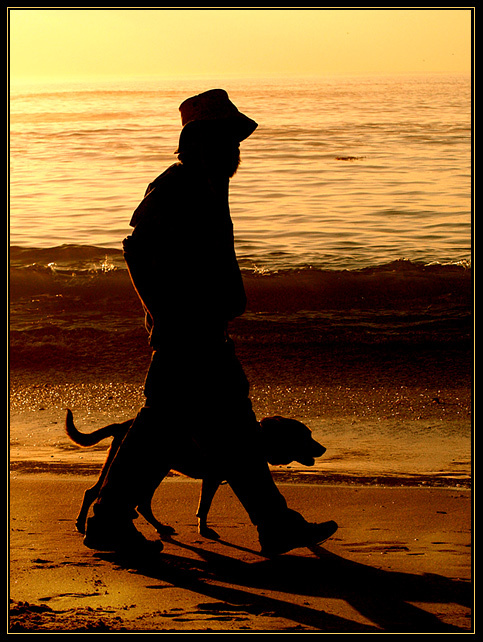 Off the wall - twas on the beach on April Fool's Day and it was lovely and there was this great guy with his dog - together they made a good picture, which I took. Then I sat and thought about a catchy title - that was the hard part. Cropped, Warmified on Picasa, pulled up shadows. Saved smaller, saved for web. I really enjoy the warm colors in your photograph. but that IS dnmc. but I still give you 6 for good photo. Love the tones & silhouetting effect. Proudly hosted by Sargasso Networks. Current Server Time: 04/22/2019 05:58:41 PM EDT.